Igloo Products Corp., the nation’s largest cooler manufacturer, will be holding a grand opening ceremony on a new 420,000 square foot distribution center in Katy, Texas. The grand opening ceremony will take place on the morning of Thursday, October 10th. 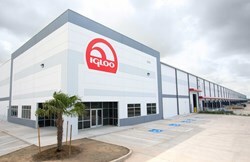 New Igloo warehouse and distribution center, Katy East, nears completion. This new distribution center is pivotal to be able to keep up with our substantial growth and to prepare for the years to come. Igloo Products Corp., the nation’s largest cooler manufacturer, will be holding a grand opening ceremony on a new 420,000 square foot distribution center in Katy, Texas. The grand opening ceremony will take place on the morning of Thursday, October 10th. The event will be held at the new distribution center located at 28501 Hwy Blvd. in Katy, Texas. Several members of the City of Katy and Waller County governments will attend the ceremony and luncheon to join Igloo in christening the new facility. The event will kickoff at 11am with a flag raising ceremony conducted by the Veterans of Foreign Wars (VFW) Post 9182. The new facility will serve as a warehouse and distribution center to handle Igloo’s growing sales and expanding product lines. Igloo produces approximately 20 million products out of their Katy facility each year. Panattoni Development Company and Evans General Contracting were selected to build the new 420,000 square foot expandable distribution center on Parkside Capital’s new West Ten Industrial Park. The site will increase Igloo’s total footprint to 1.8 million square feet and will be able accommodate future expansion, provide ample trailer and automobile parking, have cross-dock configuration with 120 dock doors and be CTPAT compliant. Igloo, one of the largest employers in the City of Katy, is expected to add 250 additional employees by December 2013, some of which will staff the new distribution center. Igloo senior director of supply chain, Patrick Poole commented, "We are thrilled with the prospect of the new facility and the ability to have worked with Panattoni, Evans and Parkside Capital, who are each the best of the best in their respective areas." This expansion to a new location coincides with Igloo’s increasing manufacturing capacity and record sales growth. "We have been experiencing double digit growth as a percentage of sales for the last three years. During this time Igloo has entered into a variety of short-term leases for warehouse and distribution space to cope with the increased level of inventory and order volume. This new distribution center is pivotal to be able to keep up with our substantial growth and to prepare for the years to come," commented Igloo chairman and CEO Gary Kiedaisch. The increased product demand and expansion of Igloo’s manufacturing capacity and facilities has lead to the creation of more than 280 new jobs within the company. For further information about the grand opening ceremony, Igloo’s new distribution center or about any Igloo product, contact Katie Davis at kdavis(at)igloocorp(dot)com or visit the company’s Web site at http://www.igloocoolers.com.